Does your home need a flooring makeover? When you turn to our professionals, you can get everything you need to transform your home’s floors to better reflect your style and better meet your functional needs. With our high-quality tile flooring, you can add a new surface to your home that combines beauty and durability. Whether you are looking for a sleek and modern design, or something that’s more classic and rich, you can find it at our flooring store. Our vast inventory holds limitless possibilities for your new floors, and our knowledgeable staff can help you sort through it all. When you come to our flooring store, our experts take the time to get to know your needs. 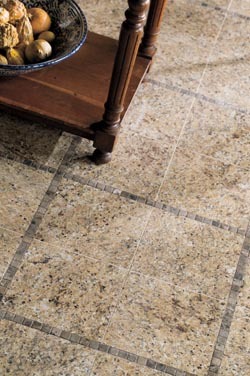 If you are installing your new floors in a high-traffic area, we may suggest ceramic tile for its durability. If you want something that has classic and luxurious beauty, our professionals can show you our selection of porcelain tile options. We also have a variety of other materials, allowing you to find exactly what matches your needs. No matter what type of tile you choose, you can count on us for superior quality. We have top-quality brands, including Design Distinctions and Floorcraft, and our sales professionals can help you determine which brands will work best in your home. Count on our professionals to put your needs first throughout the entire flooring process. You can shop for our floors one of three ways—by coming to our store, ordering online, or calling our professionals for a home delivery. No matter which option you choose, we strive to give you the most convenient and easy experiences possible. We understand that you want plenty of options. That’s why we provide such a large stock of tile flooring to browse through. We carry everything from ceramic to porcelain to slate tile, enabling you to find just what you are looking for. We can even go through the differences between the materials so you can feel completely confident in your decision. No matter which types of tile flooring you choose, each of our products is backed up by a series of warranties. These ensure you don’t have to worry about your tile fading or wearing down for up to 25 years. Come to our store or look online to find a large selection of tile sizes, shapes, colors, and textures. Mix and match to create a floor that truly expresses your style. Count on our professionals to help you upgrade not only the beauty but the functionality of your floors. As far as flooring options go, tile is extremely easy to clean. The non-porous surface doesn’t allow liquids to sink in, which not only reduces the chances of staining, but also stands up against mold and mildew. This makes tile flooring ideal for high-moisture areas like kitchens and bathrooms. There are nearly limitless possibilities when it comes to your floors, and our designers can help create custom options that give you a one-of-a-kind result. You can use porcelain tile for casual or formal settings, and enhance the beauty with accents trims of different colors or tile materials. If you are looking for a more natural look, our slate tile comes in an array of earthy colors and textures, and it’s durable enough to withstand high-traffic areas. No matter what type of tile you want, our team can help you find it. Our commitment to high-quality customer service extends past helping you choose the perfect tile. We offer professional tile flooring installation as a part of our comprehensive flooring services. With our help, you won't have to worry about your flooring project at all; we've got you covered from beginning to end. Our designers help you create the aesthetic you desire, but our installers ensure the durability of your new tile flooring. You don’t have to feel limited by the standard grid pattern—you are free to think outside the box. Our contractors take their time to ensure every step of the installation process is performed correctly. This not only ensures your new tile is placed where it should be, but also extends the life of your floors. Contact us today to learn more about our tile flooring options. We proudly serve customers in Baton Rouge, Louisiana.